The swim will be in the Philomath community pool (in the high school). It is a 5 lane 25 yard pool. Swim is 500 yards and there is a .21 mile run to transition from the pool. Swim start will be based on 500 yard swim times. 4 people per lane. Each swimmer will start 5 seconds behind the person in front of them. Starting times will reflect this delay. The 5k run course starts in the grass field south east of the Philomath Middle School and heads south out of the Philomath Middle School drive. Turning east on Chapel Drive, the course is flat for the first mile. 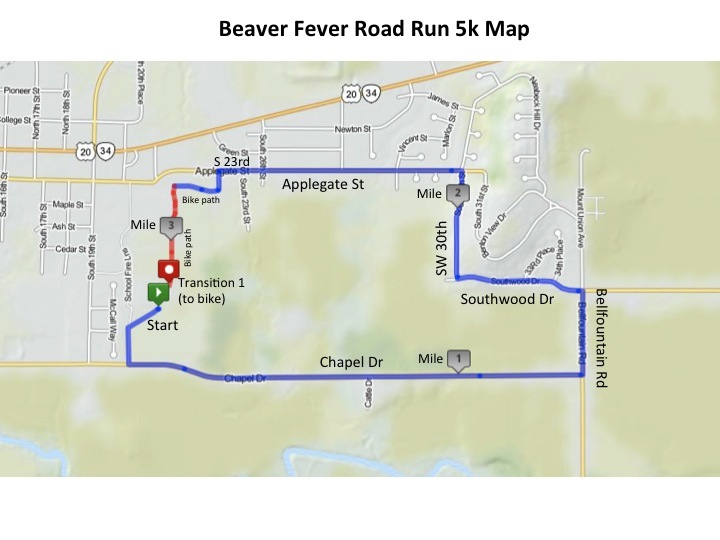 Just after turning north on Bellfountain Road, runners will head west on Southwood Dr, and tackle the course's only hill. Runners will take 30th Street until heading west on Applegate Street. The course finishes by cutting behind the Philomath High School and running back into the transition area in the Middle School parking lot. Click the button for an interactive map, or scroll to the bottom of this page for a map image. The 20 mile road bike course (new route in 2013) is a loop with a 2 short hills in the first 8 miles and a 2 mile hill at mile 8.5. Beginning at Philomath Middle school, bikers will follow the loop through smooth country roads. 2 mile Decker Hill adds a gradual climb with an exciting descent. The 5k cross-country (XC) course. Runners will leave transition and begin the fun and fast Philomath High School cross-country course. This course is marked with orange flags and cones and requires two loops before finishing. The aid station is located immediately outside the transition area and runners will pass it twice during the cross-country 5k. The same transition area will be used for both the triathlon and the duathlon. Transition will open at 7:30am for all athletes. Only athletes are allowed in the transition area please. You must be body marked and have your number on your bike prior to entering the transition area. Body marking will occur at the athletes entrance to transition. Athletes will be required to show their number on their body and bike in order to leave the transition with their bike after the race.